Miniature stampings with a lot of complex geometry is where Meier Tool & Engineering hangs its hat. 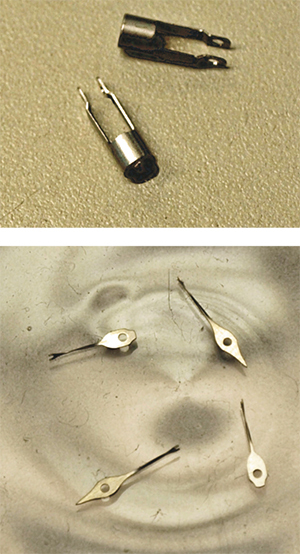 Examples are these electrical connectors stamped from beryllium copper. Tolerances on the male component (±0.010 in.) are tighter than on the female, so Meier stamps them on its Yamada Dobby link-motion high-speed presses. When the first link-motion high-speed press first landed at Meier Tool and Engineering in 2000, its benefits were immediately recognized and a real competitive advantage resulted. So says tooling manager Tony VanDanacker, who at the time served as manufacturing manager for Meier, which operates out of a 35,000-sq.-ft. plant in Anoka, MN. 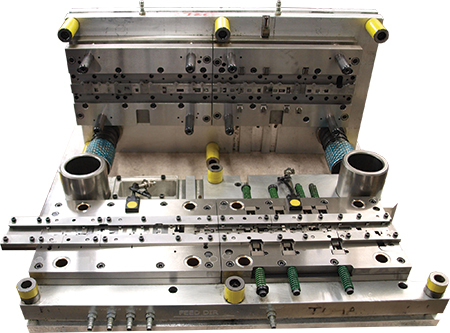 It specializes in stamping small, intricate parts from thin-gauge sheet for the medical and defense/electronics industries. VanDanacker recalls the first big job Meier completed on that first link-motion press, a 25-ton model from Yamada Dobby. Meier designs and builds one or two new progressive dies per month, which can comprise six to 35 working stations and as many as 1000 components. This die, 22 by 12 in. and with 25 working stations, stamps parts for biopsy forceps from 0.007-in.-thick 300-series stainless steel. Running at 150-250 strokes/min., it makes about 500,000 hits between maintenance cycles. That success bred future investments in the link-motion high-speed (to 800 strokes/min.) presses. The plant now is home to six Yamada Dobby presses—three 25-ton models and three 40-ton models, in addition to seven conventional high-speed presses and a 2011-vintage Aida 110-ton gap-frame servo press. Meier processes metal strip from ¼ to 3 in. wide, with its sweet spot somewhere around 1 in. Material thickness ranges from 0.002 to 0.125 in., with a sweet spot around 0.006-0.007 in. The healthy market for disposable surgical instruments and implantable devices has nourished Meier’s expanding waistline—medical work now comprises nearly 70 percent of its diet, up from 45 percent just 5 years ago. One trend the company has leveraged: OEMs seeking to convert machined and metal-injection-molded (MIM) parts into stampings, where significant cost savings can be realized. 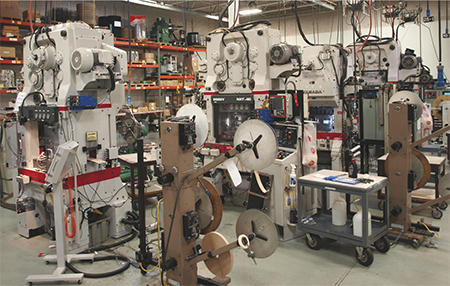 Meier’s 35,000-sq.-ft. shop houses six Yamada Dobby presses—three 25-ton models and three 40-ton models, in addition to seven conventional high-speed presses and a 2011-vintage Aida 110-ton gap-frame servo press. It processes metal strip from ¼ to 3 in. wide; material thickness ranges from 0.01 to 0.080 in. One recent conversion triumph: disposable biopsy forceps, which used to be assembled from MIM or machined parts that now are stamped on Meier’s Yamada Dobby presses. The firm runs several different dies to stamp millions of parts per year. The parts are as miniature as miniature can be—as tiny as 1 by 5 mm, “with a lot of geometry packed into that tiny space,” says VanDanacker. Such tiny, precise work comprises about half of the firm’s medical business, and that percentage grows as Meier becomes more focused than ever on pushing its quality system upstream. That means being more demanding on areas like die design and build, says VanDanacker, to help ensure that the quality of its high-speed-stamped parts stays where it needs to. “Here, quality starts early in the process,” he insists. Such adjustments seem to become more necessary as the influx of new, challenging workpiece materials increases. We’re talking exotic metal alloys such as platinum and tantalum, as well as the shape-memory alloy (SMA) nitinol—a nickel-titanium alloy finding increased use in medical implantables such as stents, orthodontic-bracket clips and vascular closures. Meier forms nitinol in heated dies at process temperatures exceeding 800 F.
Another relatively new material gaining popularity is MP35N (tensile strength to 300 ksi), a Ni-Co-Cr-Mo stainless-steel grade from Carpenter. It, according to Carpenter, provides good ductility and toughness and corrosion resistance, as well as resistance to high-temperature oxidation and hydrogen embrittlement. As parts get smaller and smaller and the geometry challenges increase, prototype development becomes more critical to landing new jobs, and new customers. Among the value-added opportunities at Meier Tool & Engineering, therefore, prototype development rates at the top. Signifying its importance, the firm completed a significant week-long kaizen event focused on its prototype department. I personally have been involved in IN-PRESS ADJUSTABLE TOOLS since 1964. As a FREELANCE TOOL DESIGNER I advocate their use in high production tool.